Partaking in public service, encouraging others and working hard were common themes during the University of Montana’s first fall commencement ceremony on Saturday. 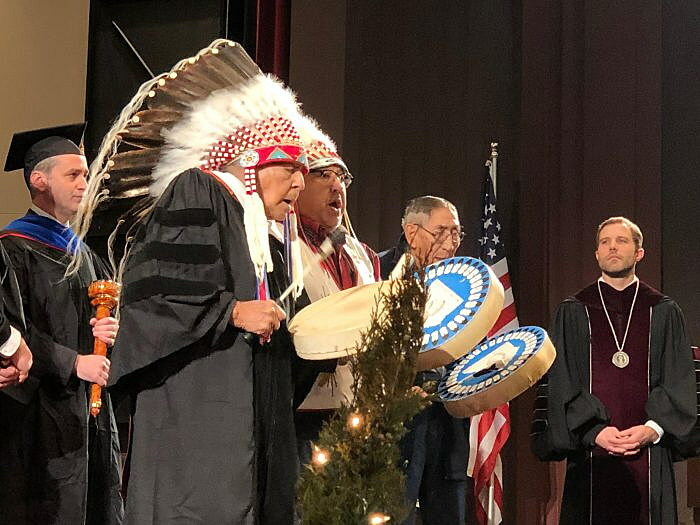 U.S. Sen. Jon Tester and Montana Attorney General Tim Fox sat among the deans and faculty on stage at the Dennison Theater as University of Montana President Seth Bodnar congratulated the new graduates and thanked faculty for their work. 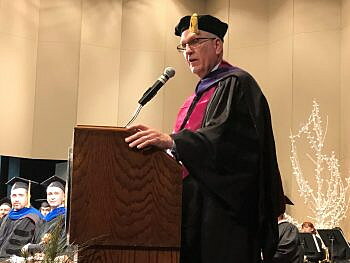 Instituted as part of Bodnar’s first year on campus, the fall commencement awarded students from the university’s professional schools, the College of Humanities and Sciences and Missoula College. Those who were awarded degrees during the summer were also included among the honorees. Keynote speaker Fox spoke from his own life experiences about the importance of public service and encouraging others. About 34 years ago, Fox said, he left college without completing his Master of Public Administration degree. Last year, he decided to finish the degree – and with help from Bodnar and Sara Rinfret, director of UM’s Master of Public Administration program, enrolled at UM once more. A month later, he was diagnosed with colon cancer. “[Rinfret] basically told me that I could do this, that I should stay on course, and that she and my university would support me along the way,” Fox said. The cancer is no longer detectable, Fox said. But he wouldn’t have been able to finish the degree without the encouragement of others. “Congratulations to all of you for completing your degree in less that 34 years. Whatever you have left to do, I encourage you to get it done,” the attorney general said. Through this experience, Fox said he’s tacked on one more thing on his everyday to-do list, and that’s to encourage at least one person a day. Whether that be a coworker or an acquaintance, telling someone they can achieve their dreams is one of the best things people can do for one another. “The encourager in you becomes the encouraged as you witness all the good that comes from such small acts of kindness and acknowledgement,” he said. Tester said creativity can help overcome life’s unexpected troubles and risk-taking, while scary at times, can pay off in the long run. In 1986, Tester said, he decided to transition his farm in Big Sandy to organic agriculture, a risk that paid off. “Behind every great business is a giant risk, so if you feel strongly about something, don’t be afraid to take that leap,” he said. 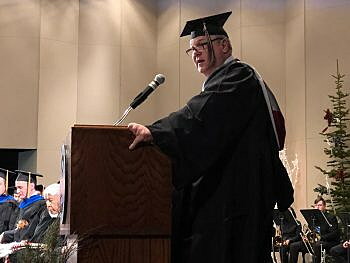 Tester also reminded graduates to save money in case of hard times and to remember where they came from. Not being afraid of an ever-changing world can be difficult, but with hard work, anyone can achieve their dreams, he said. “Each one of you are capable of achieving anything you want, if you’re not afraid of hard work. That’s what it takes to get to a point of success. Anything worth doing takes hard work to achieve,” he said.